Android’s latest mobile software, dubbed Lollipop, is, if you’ll excuse the terrible pun, the word on everybody’s lips right now, but despite the numerous features having been refined and deemed ready for prime time, the typically cumbersome roll-out has since ensued. If you’re an Android user, it’s very likely that you’ll be waiting a while before you can indulge in this new version 5.0, but if you happen to be in ownership of a Nexus, then you won’t be left hanging for quite as long. Indeed, along with the earlier release of factory images for a spate of Nexus smartphones and tablets, the system image for the Nexus 4 is now in the wild, and if you’re still in possession of this antiquated handset, then you can now… wait for it… get flashing! Sure, you can wait for the OTA update, which should manifest itself over the next few weeks, but if you don’t wish to join the hordes of Droidsters anxiously awaiting their Android 5.0 induction, then you can go ahead and flash this official image yourself. The build number for the Nexus 4-tailored Lollipop build is LRX21T carrying the date of October 21st, and at 471MB, should download nice and quickly even if your connection is perceivably as ancient as the iconic device itself. Flashing firmware isn’t exactly difficult, and if you’ve successfully managed it before, then you should have no issues here. With that said, there have been reports of issues with fastboot when pushing the update command, which has forced some to take the manual flashing route, and so if the prospect of encountering such issues disconcerts you, then perhaps just wait for the OTA to arrive in due course. As well as revamping the OS as a whole, Google has been constantly making adjustments to some of its post popular apps, and all of those given attention have thus far been treated to the Material Design. Gmail now looks spectacular on Android, and functions with the fluidity we’ve come to expect of the popular email client, while the new Messenger app that hit the Play Store earlier this week offers a similar aesthetic that looks and feels far ahead of both Hangouts and the default Messaging app. 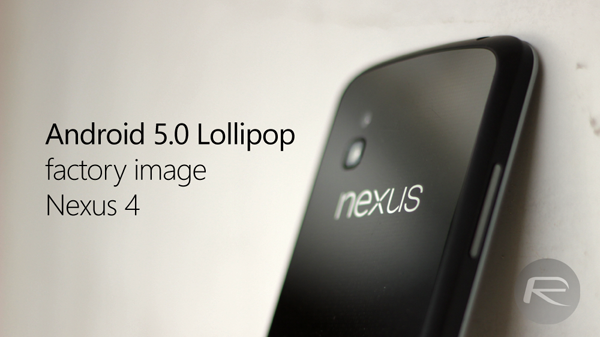 Android 5.0 Lollipop factory image for Nexus 4.